The militant group Islamic State (IS) has vowed in a rare video message in Persian that includes the apparent beheading of four captured soldiers that it will conquer Iran. In an appeal to sectarian divides, the group also calls on Iran’s Sunni minority to rise up against the Shi’a-dominated Iranian establishment. The 36-minute video, released this week by IS’s Diyala Province propaganda arm, has been dismissed by Iran’s state controlled media as an attempt the embattled group to divert attention from its losses in Iraq. Iranians are among the foreign forces fighting IS in Iraq, although they describe fighters who travel there from Iran as volunteers defending holy Shi’ite shrines. One of the IS fighters in the video, in uniform with a covered face, directly threatens the highest political and religious authority under Iran’s 1979 constitution: Supreme Leader Ayatollah Ali Khamenei. “Oh, Khamenei, you cursed person, you who has the control of the idolatrous so-called Islamic Iranian regime in your unclean hands, rest assured that soon we will destroy your house like this on your head,” the speaker says, pointing to ruins behind him. In another scene, armed men use pictures of Iranian officials, including the Islamic Revolutionary Guards Corps (IRGC)’s Quds-force commander, Qassem Soleimani, for target practice. IS has taken control of territories in Syria and Iraq, where Iran has assisted the regime of Syrian President Bashar al-Assad with military advisers and thousands of fighters. Reports suggest Iranian forces have also been involved in the fight against IS in Iraq, where Soleimani has appeared alongside Iraqi troops and Shi’ite militias. Iranian officials have said in the past that their forces have rebuffed attempts by IS to create insecurity in Iran and recruit fighters, although they have not provided details. IRGC commander Mohammad Ali Jafari said in December 2015 that Iran’s “security conditions” make it unlikely that IS could conduct a major attack in the country. “It is possible that they would do something small, but they can’t create insecurity in Iran like they do in in other countries,” Jafari was quoted by Iranian media as saying. 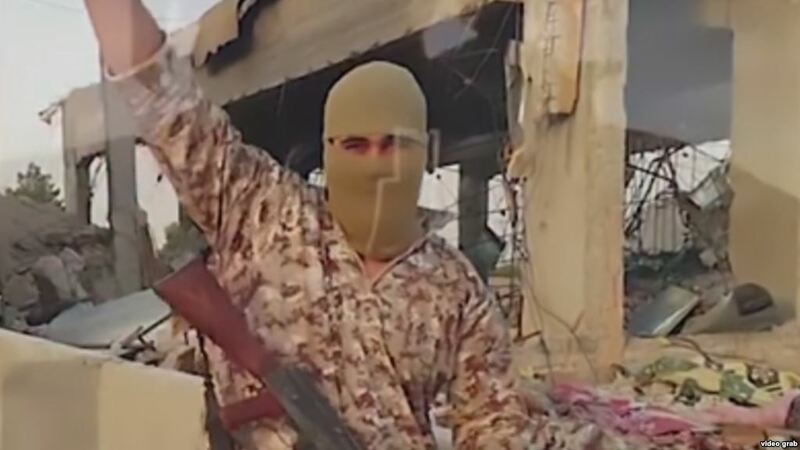 The IS video appears to be an attempt to recruit among Iranian Sunnis, accusing the 90-percent-majority Shi’ite state of mistreating its Sunni minority and violating their rights. Sunnis and other religious minorities in Iran frequently complain of state persecution. The video calls repeatedly on Sunnis to wage religious war while promising that one day Sunnis will gain control over Iran. The video also criticizes Iran for allowing its Jewish population to live in safety and have their own temples. Iran’s state controlled television said that the IS “rant…in the last days of its life” were reminiscent of threats made by Iraqi dictator Saddam Hussein against Iran. “[Saddam Hussein] claimed that he could conquer Iran within a few days, but despite having the support of dozens of countries, including the United States, he failed to occupy even one inch of our country,” the TV report said. The semiofficial Mehr news agency called the IS threats “ridiculous” while adding that the group was trying “to compensate” for its defeat at the hands of Iraqi forces in Mosul.